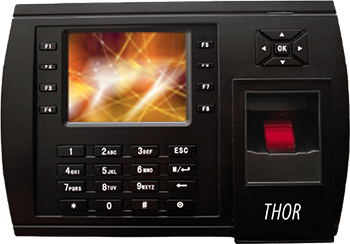 The Thor is the latest in our line of data collection terminals with biometric fingerprint verification. Not only does the Thor feature a high resolution color graphical interface, but it also comes equipped with the latest biometric fingerprint technology. This new patented optical sensor is resistant to scratches, impact, vibration and electrostatic shock. It’s hard to believe that we could make clocking in & out with the touch of a finger any easier! The Thor is also capable of performing access control functions. Use the relay contacts for alarms, bells, locks, exit switches etc. The Thor also comes with an internal bell scheduler allowing you to use the internal speaker to signal the start, end, and break times. The large LCD provides maximum readability and the on-board speaker provides audible confirmation of a complete or incomplete transaction. The Thor sends data to InfiniTime via TCP/IP. This is done with modern PUSH technology. This allows the Thor to send punches immediately when the employee punches. There is no polling or other delayed data transmission. There is an optional Wi-Fi adapter that can be purchased separately that allows the Thor to communicate on Wi-Fi networks. The Thor is simple and fun to operate. The 65,000 color LCD display makes completing tasks easy. Simply follow the directions on the screen to complete a transaction. Employees can either enter a pin number (or swipe a badge [optional functionality]) and verify their identity with their fingerprint or the Thor can be programmed for one touch identification. Choose the best solution for you and your company. The Thor is also capable of performing access control capabilities in the same fashion. Download Data to USB Drive! The Thor holds 1,500 fingerprint templates, and over 30,000 punch transactions, making the Thor a good fit for almost any organization. Pinless fingerprint identification technology makes the punching process quick and easy; giving you the ability to process large groups of employees. The Thor can be mounted to a wall for permanent time tracking in a single location or used as a mobile device where there is no physical connectivity to the InfiniTime Software. Simply download data via external USB Drive. The Thor also doubles as an access control device. Quickly Enter Tips, Miles, Commission etc. Download Product Sell Sheet now!